Josh Gordon tests the waters in Nicaragua. The Meaford native will compete as part of Team Canada at the 2014 ISA SUP World Championships from May 3 to 11th. In recent years, stand up paddleboarding and surfing have really taken off on the Great Lakes. Meaford native, turned Kincardine native, turned Toronto resident Josh Gordon started hitting the waves back in 2007 and has now landed a spot on Team Canada for the 2014 ISA SUP World Championships in Nicaragua this May. We caught up with Josh to talk about Great Lakes surfing, the World Championships, and trading fresh water for salt water. First off, tell us a bit about how long you’ve been SUP’ing and how you got started in the sport? I’ve been stand up paddleboarding since 2009; so i just hit my five-year mark. I started surfing the lakes here in 2007 and was living in Kincardine at the time. They have a big kitesurfing scene there and I saw some guys out on SUPs one day. It looked real fun so my roommate at the time and I decided to buy one. We get a little wave starved here at times on the Great Lakes and there are lots of days that are too small to ride a traditional surfboard. The paddle and extra volume in the board helped with this and I was getting not only way more waves, but longer waves and making sections I never would have on my surfboard. I initially got my SUP to surf those small days and after a while I was loving it so much I just made it my go to. You’re a Meaford-turned-Kincardine-turned-Toronto resident. You’ve likely surfed all three spots. How have you seen the scene change and grow in recent years? It’s funny, I’ve actually never surfed Meaford before. I lived there for most of my life and had no idea there was such a thing as surfing on the lakes. I was too focused on skateboarding and riding at Blue Mountain to even pay attention to it. I didn’t find out about surfing until I was over in Kincardine and found the Originsurf lake surfing forum on the internet. The surfing scene has exploded since then. Kincardine went from a handful of people on good days to 30+ on certain days. Usually 90% of those people travelled hours to come. That’s how you know that place is special. More people in the water can be a good thing or a bad thing depending how you look at it. We surfers can be selfish at times and like to keep spots “secrets” to avoid the crowds. Regardless of that it’s amazing for the community and great for the local businesses. The lake surfing community is a special one. It’s very tight-knit, and everyone gets along. I feel incredibly fortunate to be a part of such a special group. 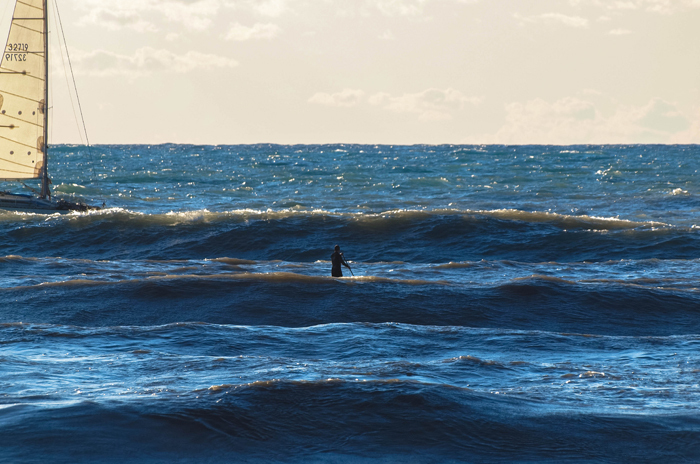 Gordon paddles out into the Lake Huron surf. Next week, you’re headed to Nicaragua to represent Canada at the ISA SUP World Championships. Tell us about how you landed a spot on the team? I got a heads-up about it from my sponsor Boardworks. I had to submit a few things and then the Canadian Surfing Association representatives went through the list of riders and chose them. I couldn’t believe that I was chosen to be on the national team and compete at the worlds. It’s honestly a dream come true. You’ve travelled to Nicaragua before but obviously not to compete. What are you expecting? What’s the surf like? Is it a huge jump from the Great Lakes? The surfing in Nicaragua is amazing. I have been going there for the last three years and I am obsessed with it. It has some of the friendliest and warmest people I’ve ever encountered. It’s not over-saturated like other places in Central America and time moves slow. For such a small country, the quality and variety of the waves are unreal. It definitely takes me a couple of days to adjust to the ocean compared to our lake waves. Since we ride wind swell here, the waves in Nicaragua have so much more power so it allows you to be able to surf the wave differently. With the contest I am expecting to have my mind blown at the level of talent there. I watch all the Stand Up World Tour competitions online and I will be competing against guys I have been watching on my TV the last few years. There are some huge names in the SUP world attending such as Sean Poynter, Colin McPhillips, Justin Holland, and Casper Steinfath. The fact that I could potentially have a heat with Colin McPhillips who is an ASP 3x longboard world champion blows my mind. When do you arrive? What’s your schedule like with the team leading up to the competition? How is the comp itself structured? I arrive in Nicaragua on Sunday and I’m meeting some of my fellow teammates from Team Canada and we are going to spend a few days practicing. The winter here has been a cruel one and has definitely affected my ability to get on the water with how much ice we had so I can’t wait to get myself in some 80 degree water and get some waves. The competition is split between SUP surfing, SUP racing, and prone racing. The surfing event kicks off first starting May 4th in La Boquita on the Pacific. The racing events follow and are going to be held on Lake Nicaragua in the colonial city of Granada. After the ISA World’s, your competing at the ESA Regionals in New Jersey. Tell us a bit about that? I am leaving Nicaragua on May 8th and flying direct to New Jersey to compete in the ESA Northeast Regionals the next day on May the 9th. 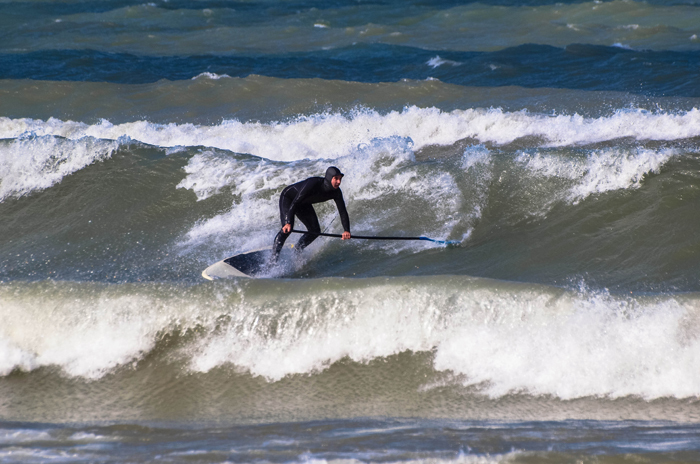 Because the event we had last October in Kincardine was sanctioned by the ESA, it allowed surfers who placed well to qualify for the regionals. This year we will have the biggest Great Lake surfing team to ever attend the event. It’s going to be really fun to be down there with all my fellow lake surfers and get ourselves in the salt water. We have some amazing surfers here on the Great Lakes and some serious talent on our team this year. We will be representing to the fullest! Kincardine’s Station Beach has been a great training ground for Gordon. It sounds like your plate is full as a SUP athlete this year. What’s your real job and how do you make it all work? My real job is working in Information Technology. Thankfully I’m in a position where I don’t need to bring my work home with me. Living a couple minutes away from the main surfing beach in Kincardine for the last eight years has certainly helped. Now that I’m in Toronto, it’s a bit more effort but I am still close to some great surfing spots. You need a vehicle to get around to all the spots and having Boardworks as a sponsor helps as well. If you love something enough, you will always make time for it. Surfing and SUP are an obsession for me and I will do it until my body is unable to. Well congratulations Josh and have a blast. Is there anyone you’d like to thank? I owe thanks to a lot of people but would definitely like to shout out Boardworks, the Canadian Surfing Association, Sweet Waterwear, Surf-fur, Jaq Raver, Mike and Grant at Surf Ontario, the town of Kincardine, my Team Canada teammates, and all my fellow fresh-water surfers. Also a huge thanks to Mountain Life Magazine on your continued coverage of Lake Surfing! To learn more about the World Standup Paddle and Paddleboard Championships visit their site. To watch a live stream of the event, visit the International Surfing Association site here.